When the next hurricane threatens, don’t be without the security of a simple solution for fresh water. Don’t drive to the market only to find yourself too late even to get bottled water. Buy one or more today for every residence. Share them with family and friends you care about. With only enough notice to fill the AquaPodKit, you can rest assured of the supply you’ll need. The AquaPodKit is not reuseable, however, considering the cost and weight of 65 gallons of bottled water, the kit is an excellent and practical solution for emergency water storage needs. Keep your drinking water supply in a closed system. 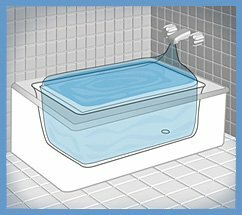 Buy the AquaPodKit today, and be prepared next time. can provide a 14 day supply of water for basic needs for a family of four, and at a much lower cost than bottled water.